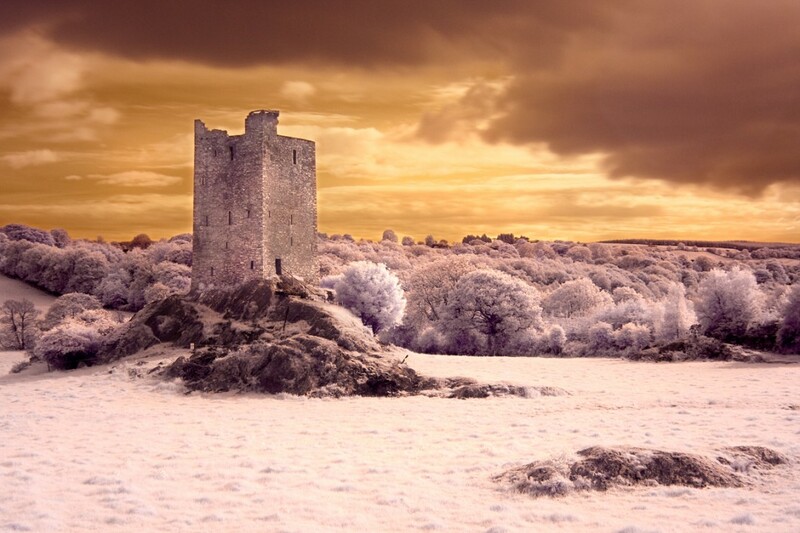 Carrigaphooca Castle wich means ‘Castle on the Rock of the Fairy’ or ‘Castle on the Rock of the Phooca’ (an Irish word for ghost or spirit) is perched high on an outcrop of rock overlooking the Sullane River near Macroom in Co. Cork. The five story tower house was built by Dermot Mor MacCarthy sometime between 1436 and 1451. As is common for early Irish tower houses, it had only a single room on each floor, no chimneys or fireplaces and had very narrow windows. The MacCarthy clan of Carrigaphooca were constantly engaged in destructive internal warfare. In 1602 they sided with the English Crown and their stronghold was subsequently attacked by Donal Cam O'Sullivan Beare. Following a long and protracted siege the thick wooden door of the castle burned down and O'Sullivan Beare retrieved a chest of Spanish gold he had presented to the MacCarthys some months previously in return for their support against the English. Prior to this Carrigaphooca Castle provided refuge to Teige MacCarthy following the Battle of Kinsale in 1601. Many people believe that Carrigaphooca is one of the most haunted castles in Ireland and there are several Phoocas said to be linked to the castle.